Recently we published an article about industrial hemp and one of the areas that are benefiting from the rebirth of hemp is our living space. The latest emerging trend is what are called Hemp Houses. That’s right, it is possible to build a house out of hemp. Hemp fibre used to be an important construction material in Europe during the Roman times and even in Japan a few centuries ago. Some of those structures are still standing. 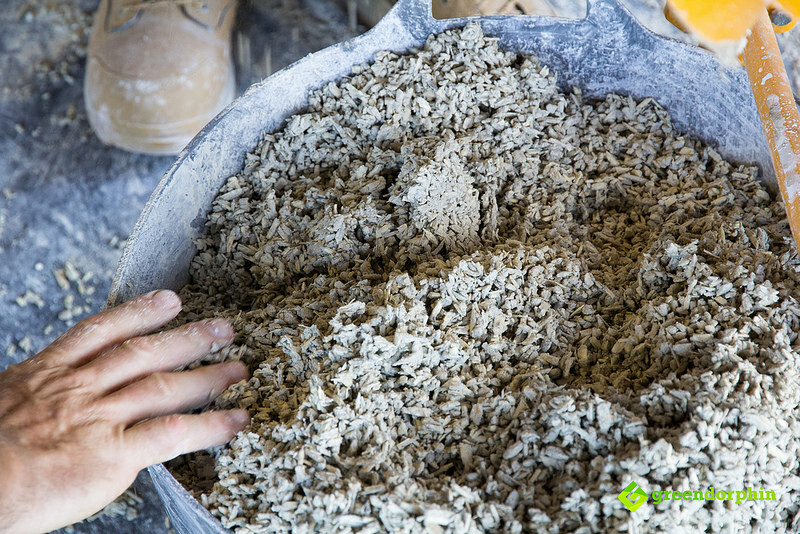 Hemp hurds mixed with lime and water makes a so-called ‘hempcrete’ and hemp plaster. These are incredibly awesome and versatile building materials. In this post, I am going to look into what is possible today in terms of hemp house construction and specifically focus on how it compares to traditional brick houses in terms of price, livability and longevity. How do you build hemp houses? During the rattling process, the fibre and the shiv are separated. The shiv is the inner core of the stalk and it looks a bit like straw or small wood chips. 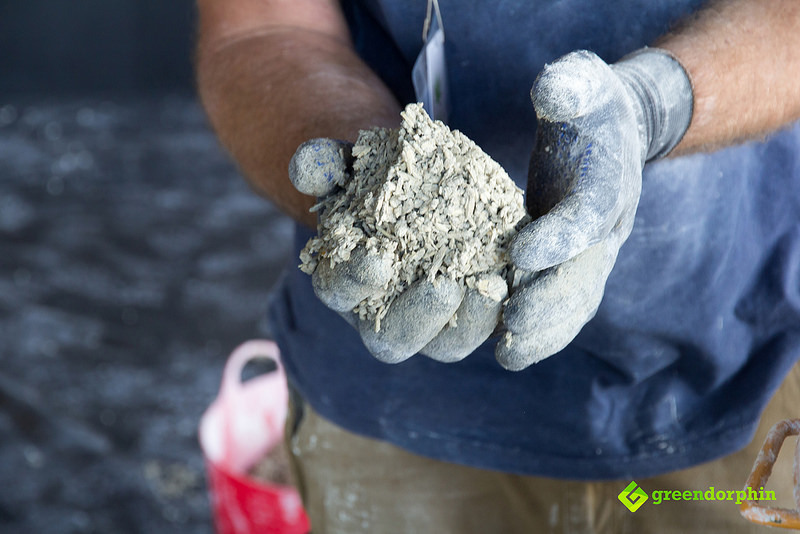 Hemp shiv mixed with lime and water is used to cast around a timber or steel framework. It is basically used as a non-load bearing masonry material. It is important to emphasize that it is used for non-load bearing parts of the house. In a concrete building, concrete itself is the structure. Concrete cracks under movement sooner or later. As your house ages and the ground ‘settles’ and moves ever so slightly, cracks in concrete will appear at some point. With hemp houses, the structure is provided by a timber or steel frame. This structure, hempcrete around a timber or steel frame, can withstand ground movement without major cracking. This makes it a suitable material to build upon in earthquake zones as well. The walls will only develop micro-cracks as a response to movement. These microcracks expose the lime to moisture and basically seal themselves. Quite unbelievable, however, this is how it works. Hempcrete is 7 times lighter than concrete. It is a lot airier than concrete as well, so it is significantly easier and faster to work with and apply on site. The process most often involves building a cast around the framework. The cast is filled with hempcrete and sets in a few hours. This process can be done on or off site. How about the insulation of a hemp house? Hemp houses have something exciting to offer in terms of keeping you warm in winter and cool in summer. Hempcrete generates huge interest in Canada as well as in Australia. Why? Because it is far more thermally efficient than most building materials on the market. Insulation is rated with an R – value. We don’t have to know much about it, apart from that it measures heat flow through materials. When building a house, we are interested in what minimum R-value our wall and ceiling insulation needs to be. The colder climate you live in, the higher that R number needs to be. The higher the R-value, the higher the cost per square metre (or square foot). Here is an example what the Australian government recommends on its Your Home website. For a city like Sydney, or Brisbane, both of which get rather hot in summer, you should aim for a wall insulation of R2.8. A hempcrete wall at a twelve-inch thickness is R20. What this means is rather mind blowing. That kind of insulation saves an incredible amount of energy on both heating and cooling. That is why Canada and Australia are both paying attention. The secret lies in the cellular structure of hemp. The structure traps in air and when it is mixed up with lime and water, it creates excellent properties for insulation and thermal inertia. The thermal inertia is the key reason for hemp houses being so comfortable in winter and summer. During the day the temperature goes up and down. It can be cold in the morning and hot during the day. Hempcrete can balance out the fluctuation in temperature and provide a comfortable microclimate all day long. How about the environment, how does the environmental footprint of a hemp house compare? Hemp houses are significantly more sustainable than concrete. Hemcrete is a breathable material and it regulates not only temperature but also humidity. The hemp house significantly improves the air quality inside the house as well and it also reduces the amount of airborne moulds and toxins that can often lead to respiratory diseases. Every square metre of concrete wall results in approximately 100kg of CO2 emission. Hempcrete absorbs CO2 in the course of its lifetime as the result of the so- called ‘carbotitation’ process. During this process, the lime-based binder absorbs carbon over time. This process is slow and goes on for decades. Every square metre of hempcrete absorbs about 30kg of CO2 during its lifetime. So hempcrete is actually carbon negative, it takes more CO2 out of the atmosphere than it takes to produce. It is also saving trees. Hemp produces roughly 4 times more raw fibre than trees and it is produced in 12 to 14 weeks. Trees take decades to grow. It is easy to grow and does not require anywhere near as much nutrients as cotton for example. Hemp production is good for the soil and for the environment. In addition to all the above benefits, the hemp building material is also naturally resistant to pests, such as rats and mice, so one less thing to worry about if you live in a hemp house. How do you deal with termites in a hemp house? Termites are a concern to many people around the world. Australia is a good example of a country where you can’t really build any structure without thinking about keeping out termites. Hempcrete is naturally termite resistant, so you can tick termites off your list. How long does hemp houses last? Some of the early structures built from hemp are still standing few hundred years on. A home built out of traditional building materials are built to last up to 60 years or so. They may or may not last that long. You may recall the carbonization process we discussed above. When the lime-based binder in the hempcrete absorbs CO2 from the air? Well, during that process the hemp shiv gets petrified and literally turns into rock. How flammable is a hemp house? There is a lot of Cannabis being burnt so a hemp house must be flammable, right? No, it is actually one of the most fire resistant building materials. Hempcrete makes a very robust building material that can withstand high impact as well as fire very well. How about the cost of a hemp house? The technology is improving quickly and that is good news for affordability. These days, building a hemp house is nearly down to the cost of building a house out of traditional building materials. So the upfront cost is similar, however, the ongoing running cost will save hemp house owners a lot of money over time. On heating and cooling, you can expect to spend up to 70% less with your hemp house! Incorporating that it is expected to last a lot longer, so if you are planning to build a new house, it seems to be a great investment to make your next home a hemp house. Are you thinking of building a hemp house or do you already have one? Please share your thoughts or experience below! What Does the German Marijuana Reform Look Like – And Why Should You Care?